You are here: Home / nutrition / How to Use this TINY Seed to Create HUGE Changes to Your Health! How to Use this TINY Seed to Create HUGE Changes to Your Health! 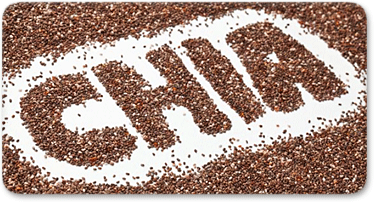 Chia seeds stake a claim as arguably the very first superfood, with legend having it Mayan and Aztec warriors would consume these seeds before battles or long runs to give them energy and sustain themselves during long periods of exertion. These tiny seeds pack a powerhouse of nutrients, and it was said that just one spoonful of chia seeds were enough to sustain Mayan and Aztec runners and warriors for 24 hours. Calorie for calorie, chia seeds may be one of the healthiest foods on the planet, as they pack all of these essential and health-fortifying nutrients into an easily-digestible, gluten-free, low-sugar snack. The high levels of fiber and protein, combined with the way the outer chia seeds expand with water up to ten times their original size to form a gel-like consistency, help chia seeds provide a high level of satiety, which is the feeling of being full and not wanting to eat more. This helps with appetite suppression and lowers the potential for food cravings between meals when less healthy snack options tend to be consumed more frequently than at other times. The soluble fiber in chia seeds also serves as a highly beneficial prebiotic that helps feed and promote the growth of healthy probiotics in your gut. 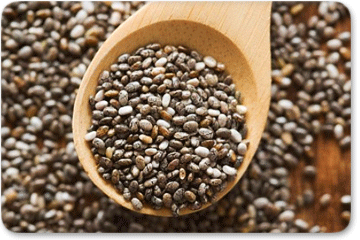 The benefits of chia seeds even extend to burning belly fat! Studies have shown that regular consumption of chia seeds can help reduce visceral adipose tissue, which is the belly fat tissue most responsible for your body’s metabolism. While Chia seeds can be eaten in their natural form, the best ways to consume them is by either first soaking them in water or another liquid or grinding them and then sprinkling them over a salad or similar dish or adding them into a smoothie or drink. Soaking chia seeds will make them considerably easier to digest and enable your body to more efficiently access all the healthy nutrients in the seeds. In celebration of National Men’s Health Month our friends over at Nuts.com have created a wonderful infographic they generously agreed to share with our community members. 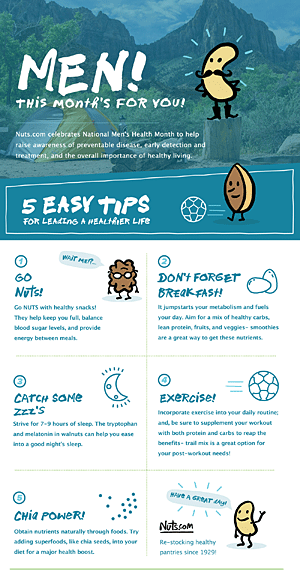 Here are 5 easy tips that lead to a healthier lifestyle. If you are interested in adding Chia Seeds to your nutrition plan you can find them as well as many other healthy snack ideas by tapping the follow link: Healthy Snacks. However you decide to use chia seeds in your diet, just know that you’ll be doing your body and overall health a big favor by doing so! Martínez-Cruz O, Paredes-López O. Phytochemical profile and nutraceutical potential of chia seeds (Salvia hispanica L.) by ultra high performance liquid chromatography. J Chromatogr A. 2014 Jun 13;1346:43-8. doi: 10.1016/j.chroma.2014.04.007. Epub 2014 Apr 13. Ames BN, Shigenaa MK, Hagen TM. Oxidants, antioxidants, and the degenerative diseases of aging. Proc. Natl. Acad. Sci. USA Vol. 90, pp. 7915-7922, September 1993. Poudyal H, Panchal SK, Waanders J, Ward L, Brown L. Lipid redistribution by a-linolenic acid-rich chia seed inhibits stearoyl-CoA desaturase-1 and induces cardiac and hepatic protection in diet-induced obese rats. J Nutr Biochem. 2012 Feb;23(2):153-62. doi: 10.1016/j.jnutbio.2010.11.011. Epub 2011 Mar 22. Chicco AG, D’Alessandro ME, Hein GJ, Oliva ME, Lombardo, YB. Dietary chia seed (Salvia hispanica L.) rich in alpha-linolenic acid improves adiposity and normalises hypertriacylglycerolaemia and insulin resistance in dyslipaemic rats. Br J Nutr. 2009;101:41–50.